Liks displaying his work at our Pemberton shop! Liks is a graffiti artist, husband and a dad. The one constant that remains from a young age, is his avid interest in graffiti – the lettering, the artists, the history – Everything Graffiti! Come check out some of his pieces adorning our Pemberton walls today! …back when he was a teenager in his hometown of Melbourne, Australia. Believe it or not, his parents didn’t yell or punish him for releasing his cans of spray paint — instead they encouraged him to express himself artistically and bought him his first book on graffiti – “Spray Can Art”. When he was 19 years old, Liks moved to Canada and the beautiful mountain resort of Whistler. 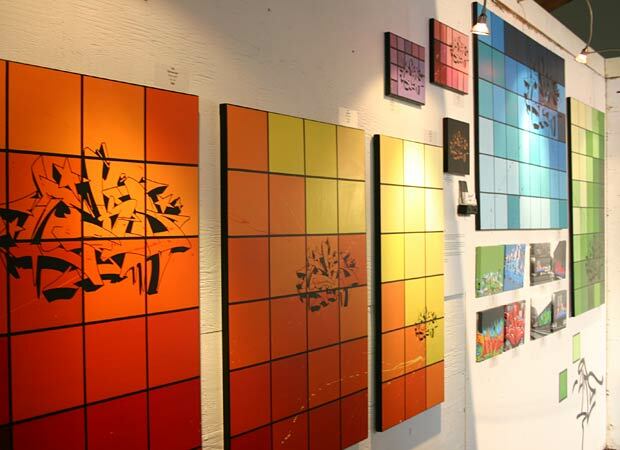 Although embracing the laid-back mountain lifestyle, his passion for street art is undeniable. Combined creativity and strong work ethic have resulted in various successful projects with local businesses, and clients abroad. Most people curse when stopped by a train, but Liks enjoys watching the graffiti painted freights that roll by, finding inspiration from these moving displays of art that travel vast distances across the continent. Apart from enjoying his family, Liks is happiest when painting and in the future hope to continue to grow and brighten our dull boring walls everywhere, giving people something interesting to look at and enjoy.